2017 seems to be no exception for the busy season many wedding planners are gearing up for as well as floral designers who are creating seasonal masterpieces for brides to showcase on their special day. Traditionally, you may have seen a ton of flat, red rose arrangements but now there’s a contemporary approach to matching December’s theme with a list of fresh, alternative blossoms. 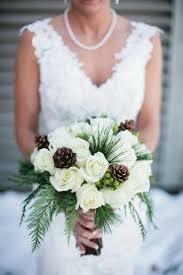 Trending this month is a sophisticated color mix of burgundy and cream, white with pine cones and seasonal greenery, exotic tropicals and also a wintery combination of white, gray and green. All very different from one another in style, check out these exquisite bridal bouquets which might just be the ideal vision of bridal bliss you’ve been looking for! 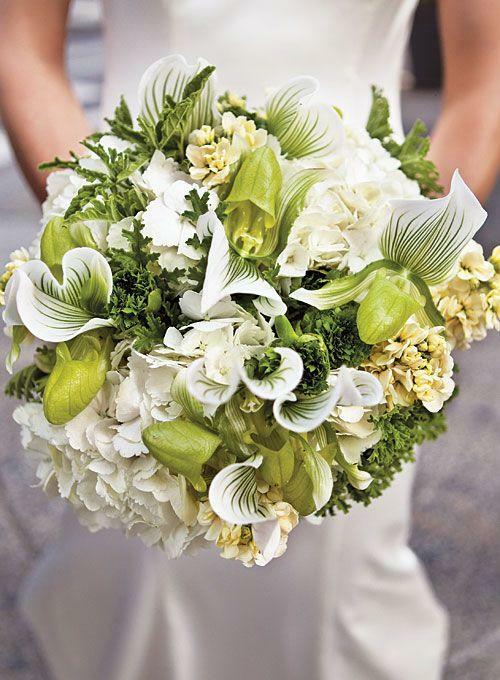 This is one of my favorite examples of how to ditch the standard white, green and red motif for something far more interesting… In this bouquet, we see white and green striped cyclopediums enhanced with white hydrangea, seasonal foliage and ruffled green gerbera daisies to finish the piece. This is for the bride who isn’t afraid to walk on the edge of wedding traditions- a bride who dares to be different and isn’t at all inhibited to have all eyes glued on her. Yes, this is going to run a little pricey but the good news is, these species should outlive other alternatives because of their sturdy stems and heads.